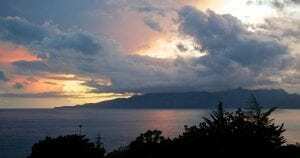 See in real time the weather situation in Maratea, Basilicata, with live streaming webcams from Hotel Villa Cheta. Placed in the highest part of our Hotel, the heading North webcam will show you the weather in real time filming the gorgeous view up to Capo Palinuro. The heading South webcam has a splendid framing on the coast of Maratea; during clear summer days you can even see Stromboli Island.